Rain rain go away, come again another day. Well, it did go away then came again that same afternoon. Riders from all over the North Island had nervously eyed the weather maps for a week, everyone making their own assumptions about what may play out weather wise for the weekend. After all the worry and assumption, we were greeted Saturday with near dry conditions at practice day for the first 440 Enduro, stoked! With only one run per track allowed over practice riders had to adapt whatever strategy they thought most effective to learn the lines and get the most out of limited runs. Lots of walking sections, pushing up, re-riding, checking sneaky lines and wondering if the forecast rain would actually come later in the day. As practice was drawing to a close the clouds rolled in and it looked like it would rain. Fortunately it held off a while as riders either gapped it home or flocked to the Orere point camp ground to take shelter. Fortunately in our case (three stooges from the Waikato) we managed to nab the last cabin after initially planning to tent. Lucky for us as by the time we got to the camp (it's literally five minutes from 440 park) the heavens had well and truly opened and torrential rain poured forth. As with any well organised event these days, the crew had organised a get together at the local pub (the Clevedon Hotel) Saturday evening to ensure everyone was fed and watered (or beered), a burger and beer for $20, bargain and certainly not 'Auckland' prices! After consuming our weight in burgers, chips and cheesy pizza we cruised back to the camp and attempted to sleep. A long night of sleep interrupted by heavy rain on a tin roof, and cabin mates sharing snoring responsibilities meant morning took an age to come. Waking to blue skies the sleepless night was forgotten, and with a big breakfast topped with The Collective's brekkie yoghurt (plug plug) we were charged up and ready to take on the slippery goodness. Fortunately for everyone, a delayed start meant trails had drained well and most were almost in perfect condition bar the odd puddle or slippery corner. There were a couple of exceptions to this though, with G Banger being pretty much a mudslide. What would a race be without a bit of a challenge?! Once again tactics came into play, with many riders opting to crank out their runs as soon as possible, while others played the waiting game, drinking coffee and chilling around the base area, waiting for the afternoon to hit in the hope that what was left of the slippery sections would dry off and they could cram their race stages in the last three hours of the day. Unfortunately transport had some issues, with a bus breaking down and a ute blowing its radiator cap. This hiccup set things back a little but everyone took it in their stride and the 440 crew adjusted the schedule to ensure everyone got their stages completed. With prize money up for grabs, the pointy end of the field was stacked with talent and the race drew some big names. Wyn Masters wanted a piece of it, as did Hayden Lee, Matt Walker, and Keegan Wright, among others. Every one of these guys apart from Hayden overcame early setbacks to take a step on the podium. Hayden reinjured his neck, withdrawing from the race, Matt blew out a shoe and went on the scrounge for some loaners, and Wyn and Keegan both broke chains either in a stage or during practice. Like the classy riders these guys are they didn't let the setbacks get to them and pushed through the day all the way to the podium. Matt Walker swooped in on the 50,000 year old slab of Kauri that formed the trophy and took the win, with Wyn Masters in 2nd, and Keegan Wright in 3rd. For their first event the guys at 440 did an exceptional job, nothing was lacking and everything ran to plan, and even with a few curveballs thrown their way the took it in their stride and adjusted things to suit. It's fair to say this was an awesome event, with really good atmosphere and a chilled vibe. 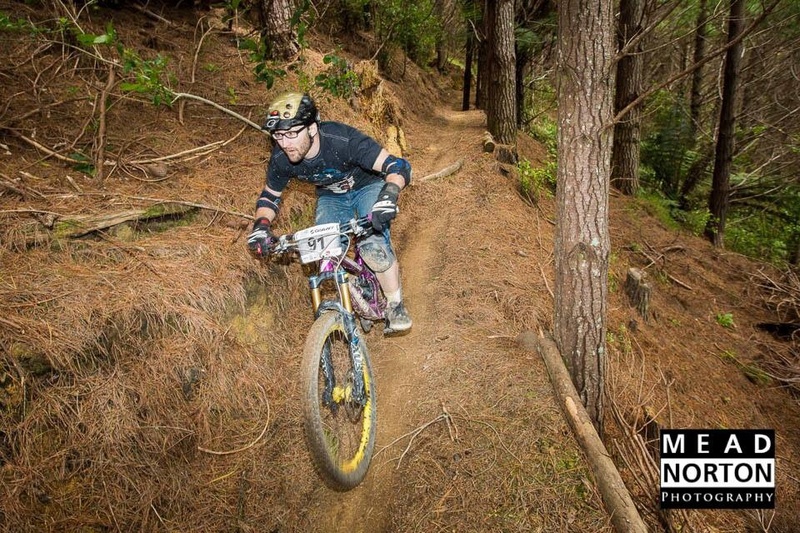 Be sure to get amongst the action at their next Enduro in January. If downhill is more your thing they're putting the final touches to their downhill track which will be raced on the 30th November for Auckland DH champs, and again as a round of the National DH Series end of January. For more info on upcoming events check out the Fourforty MTB Park website. All images courtesy of Mead Norton Photography. Coming Soon: 440 Enduro V2.